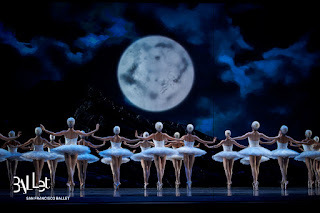 Dance Commentary by Heather Desaulniers: San Francisco Ballet - "Swan Lake"
Opening nights hold such special promise – expectation, anticipation and excitement for what is about to come. But what about closing chapters? What do they bring to the table? Wistfulness, reflection and perhaps even some sadness. In some cases, also an equal sense of celebration and commemoration. San Francisco Ballet’s Saturday evening performance was one such event: the final showing of Swan Lake, and two company retirements, principal dancers Vanessa Zahorian and Davit Karapetyan. It was a memorable night, to be sure, beginning with a tribute video to these two amazing dance artists, followed by their stirring portrayals of Odette/Odile and Prince Siegfried. Choreographed by Artistic Director and Principal Choreographer Helgi Tomasson in 2009, Act I of the classic narrative begins with a prologue, where the maniacal Von Rothbart (Sean Orza) captures Odette and transforms her into a swan. After that brief contextual introduction, the first ensemble scene unfolds, taking place ‘outside the palace’, as the program notes explain. Village settings are a staple in story ballets, but for me, they tend to go on a little too long in most cases. The same is true when it comes to Swan Lake, though the choreography in this particular version does help to move things along. The men’s pas de cinq conveyed sharp and precise batterie as well as unmatched, spot on unison. Apart from some squeaky shoes, the featured pas de trois was charming. Koto Ishihara’s vast echappés delighted, as did Lauren Strongin’s sissone/assemblé combination. Esteban Hernandez dazzled with turns that finished with the accent up and jumps that took him soaring into the atmosphere. And of course, there is the introspective solo towards the end of the Act, where Siegfried contemplates his existence, in terms of duty and responsibility.